If you’re unfamiliar with the name Rooster Teeth, you may know one of their heralded, long-running web series such as “Red vs. Blue” or “Immersion, or you might be familiar with their chart topping audio and video podcast. Producing the longest-running web series (“Red vs. Blue”) for 11 years and counting as the cornerstone of this continually expanding company has done nothing to slow the flow of their creative juices and desire to grow even more. To produce its first full-length feature film, the company launched an Indiegogo campaign to fund the production of their original script, Lazer Team. Reaching their target goal of $650,000 in about 10 hours, and flying well over $1,000,000 in less than three full days, the boys behind Rooster Teeth were once again breaking records and paving roads for new media companies everywhere. We caught up with company co-founder and creative director Burnie Burns for a quick chat about creating such a successful crowdsourcing campaign, as well as the fears and pitfalls of this growing form of fundraising. 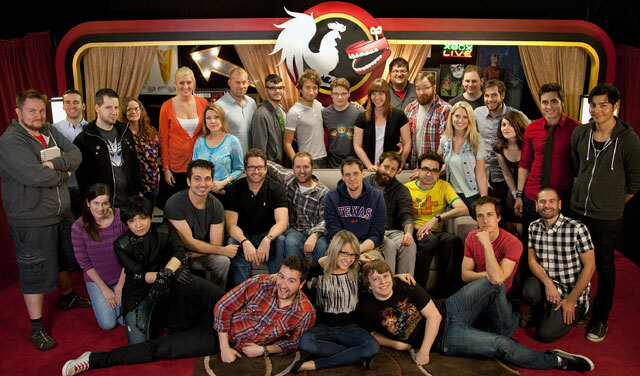 Congratulations on the success of the campaign, and pretty much [on the success of] Rooster Teeth as a whole. It feels like you guys have become a gold standard for making your passions into something real. That’s very kind of you to say. Thank you very much. You put a section in the campaign about trust; reaching out to those who may have been failed by crowdsourcing before. On your own programs, you’ve touched on subjects — though they may be on a different level — but the idea of, let’s say, the Oculus Rift being bought out by Facebook, and what people feel they are owed from that. Did you yourself have any trepidation about using Indiegogo or crowdsourcing because of this? I think that crowdsourcing is a confusing thing for a lot of people. I think more so with the Zach Braff movie — people wanted that movie to be made, but then when it reached the logical conclusion that the film was then sold for distribution essentially, some people got confused by that too. But ultimately, I think most people want something that they crowdfund to be successful. There are some people out there, a local minority that gets confused by things like that — but we absolutely did look at that. I think crowdfunding is designed exactly for what we’re doing. We’re an independent company. We’re a group of small artists that have an audience, and people know who we are — but at the same time, we’re trying to do something that is totally outside of our comfort zone; to do something that we have not done before — a stretch. Crowdfunding is not only a way to make that possible on a financial level, but it’s also a way to gauge the interest of our existing audience in seeing us do that. I think in the first two days, I think it proves that the audience absolutely wants to see us to do that. You brought up the Zach Braff movie and the idea of it getting distribution and how that works. You guys look like you have it set where your goal is literally just going to be like everything else you do: you’re going to make it, you’re going to do it yourself, and you’re going to put it out there, whether as a digital download or as a hard copy, and that’s it. Did you think about maybe releasing it in theaters, or [getting] distribution through another route? Oh sure, yeah, we’re format agnostic for content. We were careful to not say it’s going to be theatrical and not say it’s going to be all-digital. I think I said in the recent FAQ (or if not, it’s the one that is about to go up) — when a piece of content is created, when we make it and it’s time to distribute it, we look at whatever the right thing for that piece of content at that point of time is. Like I said, that’s our goal. We can’t predict 12 months from now — there could be a form of distribution that someone creates in the next six months that becomes enormous that we can’t possibly predict. As we get closer to the end of production, we’re going see what the opportunities are. We just want to make a great piece of content and make it available to as many people as possible. You know your fan base, and you know how many people follow you, but were you still surprised by how much you’re pulling in for this? Yeah. It shows the power of crowdfunding. If you look at the size of the Rooster Teeth fan base, we’re knocking down records and kicking in doors and we have at this point 17,000 backers. Seventeen thousand backers just out of our YouTube subscription base of seven million-plus. That’s two-tenths of one percent that are driving this thing and helping us do this next thing. We do have a huge audience. Even beyond the crowdfunding, we have a group of people within our fan base that are helping us make a piece of content that we’re then going to get to show the other 99.8 percent of the fan base that hasn’t gotten involved yet. You made your goal and you exceeded it without selling out the bigger-ticket incentives you were offering, which are often the first things to go in crowdsourced projects. Are you surprised by the way the monetary intake has occurred? You made [the money by selling] a lot of smaller-priced offerings. If you go back and look, we sold a lot of the bigger ones; we sold a lot of the ones that are based on our well-established Rooster Teeth shows. We haven’t yet sold the “walk-on role in the movie,” and we sold some of the [other high-priced rewards] but they haven’t sold out. We had to go back and add some of those higher-priced “luxury” items in there. We looked at a lot of crowdfunding campaigns and analyzed breakdowns — I went through the Veronica Mars fundraiser; I went through the Zach Braff fundraiser; we got a lot of sage advice from Freddie W., who’s had three successful crowdfunding campaigns. The average backer for a really successful campaign — the ones that go up to $4 million for a film — the average backer pays between $70 and $100. So, the bulk of support comes in traditional ways: through pre-release DVDs, some t-shirts and promotional items that go along with the movie, and exclusive merchandise. While the big ones are big numbers, if you add up all of our luxury tier items, [it totals] about $60,000. They’re huge contributions, and it’s amazing when people do it, but the most we could sell is between $50,000 to $60,000. If you look at a million dollar campaign, that’s between four and five percent. The rest of that has to be made up by large volumes of people doing those mid-level tiers. You have a very specific schedule mapped out for this. You guys spend a lot of time on your [current shows and projects] — how difficult has it been to fit Lazer Team into your normal day-to-day operations? Well, Rooster Teeth has grown quite a bit, and so if you’re familiar with the way the company runs, it’s no coincidence this movie is going to be starting just as some of our bigger summer productions start ramping down. Now, we can move a lot of [our animation team] over into our visual effects as we’re shooting the movie; visual effects that are taking place while we are doing production. A big part of this is timed with the move to our new studios. Now that we’re in that environment and have the full production environment in there, we just want to hit the ground running. And making a feature was part of that long-term plan. You also mentioned talent in your campaign — you were going to go search for some other people [to be involved in the film]; it wasn’t only going to be the familiar faces [from other Rooster Teeth projects], although I’m sure they’ll be in there. Do you have specific ideas of what you want? Do you want fresh faces, or do you want to go out and get some big names? Some of our audience and backers said, “Hey, why don’t you just put a goal out there that says, ‘If we’ve reached X dollars, we’ll hire this person’?” I say, “That’s not the way it works.” A talented actor is not going to say, “Well, if your movie [raises] $2.5 million, [I’ll be part of it].” That’s not the way these conversations work. As this campaign goes up, as it breaks records, as it gets a lot of press, more people take notice of it and we start to have conversations: “Hey, what’s going on with this? Where are you guys going to finance it? When are you guys shooting this?” Those conversations have already kicked in [with] people who are interested in the project and want to find out more about it. That’s what leads talented people toward [becoming involved in] the project and making a better movie. I know you guys are very big film fans, and most of you went to school for film. Not saying that you’re going to do homages and spoofs or something like that, but are there certain things that you’re looking to for extra inspiration? Do you think about recent films, such as Attack the Block — is this kind of what you’re going for? We’re very big sci-fi fans. “Red vs. Blue,” in addition to being the longest running web-series on the internet, is now also the longest-running American sci-fi show. We love sci-fi; we love comedy. It’s the perfect fit for us to make this. We’re being very, very careful that while we draw inspiration from a lot of the sci-fi classics that we’ve grown up with, we’re not making a parody and we’re not making a send-up — we’re making our own movie.